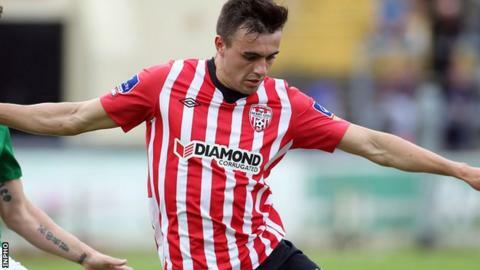 Derry City picked up their biggest win of the season and eased their Premier Division relegation fears with a 4-0 win away to Galway United. All the goals came in the second half, with Ciaran O'Connor opening the scoring on his debut after 52 minutes. In-form Mark Timlin hit a brace to take his tally to six goals in three games. Stephen Dooley rounded off a comfortable night with an 89th minute strike at Eamonn Deacy Park to move Derry six points clear of Sligo Rovers. Sligo occupy the relegation play-off position but back-to-back wins for Derry over Longford Town and Galway have eased the pressure on Derry manager Peter Hutton. Derry had the better chances in the opening half on Friday night but failed to make the breakthrough. Patrick McEleney had a half chance before limping off with a suspected rib injury after 20 minutes. His replacement, Ciaran O'Connor, made an immediate impact on his debut, the on-loan Dundalk striker going close with a header. Ryan McBride forced a superb save from Galway goalkeeper Ger Hanley, turning and hitting a fierce left-footed volley which Hanley pushed out for a corner. David O'Leary was caught in possession in midfield and Timlin slid the ball through to O'Connor, who broke the deadlock with a composed finish to the top of the net after 52 minutes. Galway were robbed of the ball on the edge of the box and Dean Jarvis was tripped inside by Cormac Rafferty. Timlin stepped up to convert the penalty in the 61st minute. Three minutes later, Derry clinched their third goal with O'Connor turning provider for Timlin, who confidently slotted the ball under Hanley for his tenth goal of the season. Jake Keegan hit the post for Galway before Derry rounded off the scoring through Stephen Dooley late on.